Ah, Indiana in the winter…always a pleasure. Don’t get me wrong, I love visiting my family around the holidays, but the weather, not in the slightest. I hail from southern Indiana, where winter is more survived than enjoyed. I did not grow up skiing the slopes or even sledding a whole lot. I do remember being cold as heck huddled up to the barrel stove (built by Dad) in the cabin (also built by Dad). I also remember slipping and sliding, in my shiny dress shoes, as I negotiated an ice laden porch in terror and my Dad lighting fires under my Mom’s car to warm it up enough to start so she could get to work. And then there was Sara W.’s mom, who slipped on the ice and broke her hip. She couldn’t walk for a really long time…and as I remember, the Methodist church built that ramp out back so she could be wheeled in for the service. I want a more positive view of winter. I really do! I want to learn to love it, because I only have a maximum of 50 of them left in my lifetime. 😀 Therefore, I planned my visit to Hoosierland this year with a specific purpose: Do something that equates to winter fun. 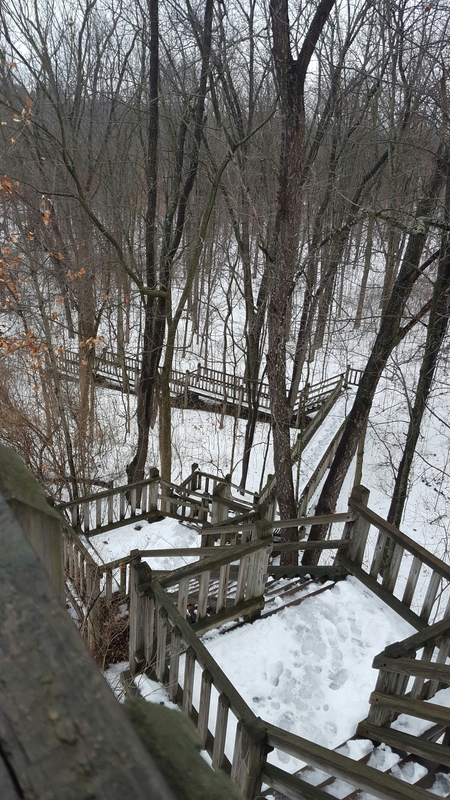 I made reservations for December 23 at the historic Potawatomi Inn at Pokagon State Park and literally prayed that 1) there would be snow on the ground but 2) there would not be a blizzard to keep us from going. With my niece in tow, we headed out to Terre Haute to pick up my son on the 23rd. Two hours and a coffee shop stop later, we had him in the car. Turn around, get on I-70 headed back east across the state to Indy, then north on I – 69 to the park. No snow, but I drove north in a cold, dark, yucky rain for 3 hours before reaching our exit north of Angola. But Hurray!! Food was still being served, there was SNOW on the ground, and sun was in the forecast for Christmas Eve! Nothing like a hot buffet with really good food! We got the toboggan. Jesus Christ, this thing is heavy. Well, this is why we have children, yes? We managed to get it up the stairs to the beginning of the ride…and to contort ourselves into the requested riding position. Niece in the front, son in the back, me in the middle, legs intertwined like we were playing some sort of weird twister..Here. We. Go!!!!!!!!!!!!!!!!!!!!!!!!!!!!!! It was scary BUT a ton of fun! We got up to 38 miles per hour before shooting out the end onto the snow covered lawn of the inn. 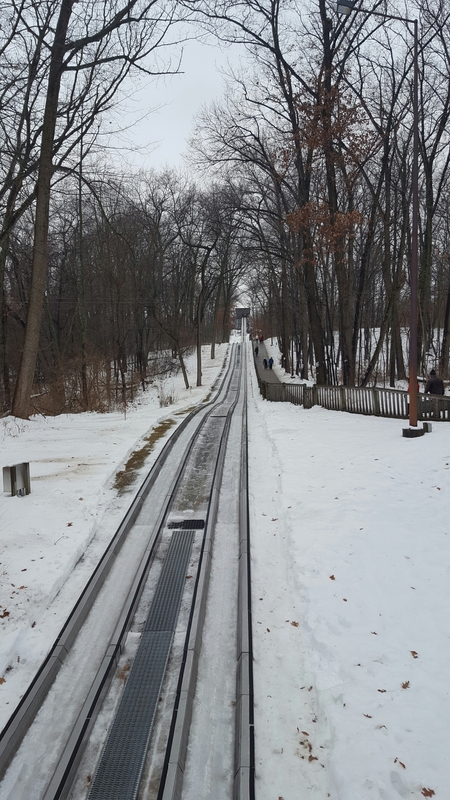 The line was pretty long after our first ride, so we opted to turn in the toboggan and take a hike instead. 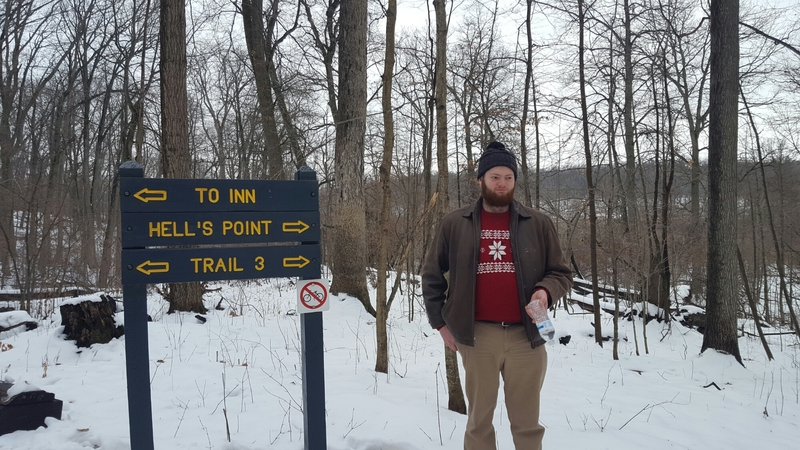 Midwesterners seem to be incredibly pragmatic in naming their trails…we took Trail #3 as it went to one of the few spots with a descriptive name “Hell’s Point”. The trail was short (2.2 miles) but had nice variety to it as it traversed marshes and woodlands. Hell’s Point wasn’t as interesting as I had hoped, but it didn’t matter. 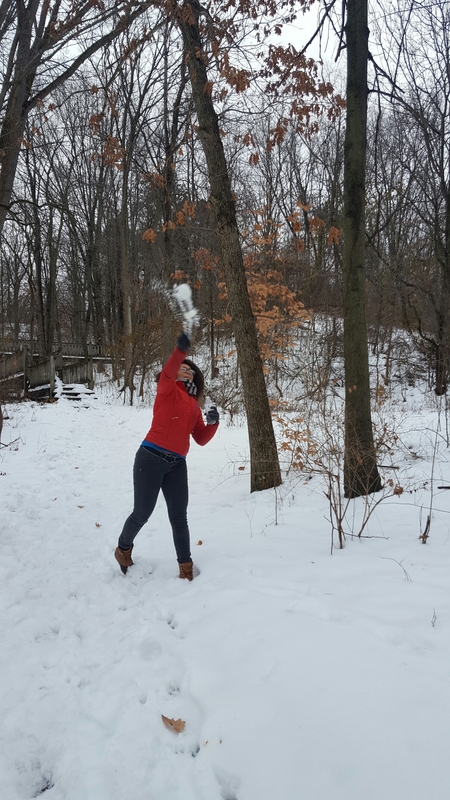 I was spending time with my son and niece, in the snow, in the cold, and I was loving it! Of course, coming down from Hell’s Point on the stairs, all I thought about was Sara W.’s mom and breaking my hip…Hike On! 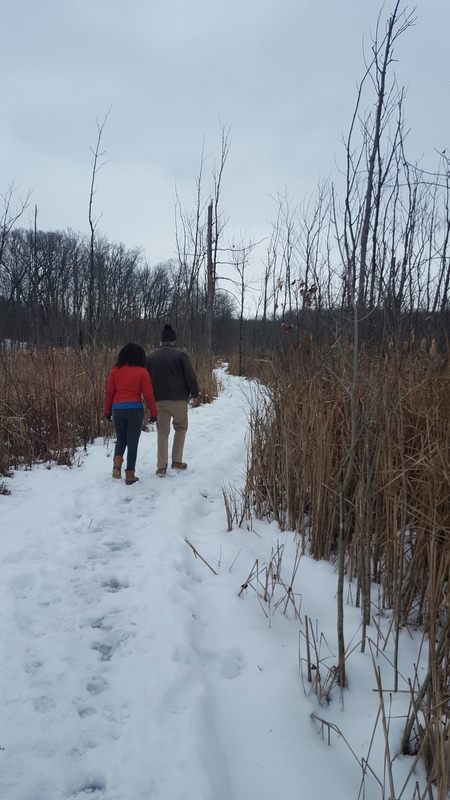 This entry was posted in Uncategorized and tagged hikes in northern indiana, Hiking, hoosier hikes, Indiana Outdoors, indiana state parks, pokagon state park, toboggan ride, winter hiking. 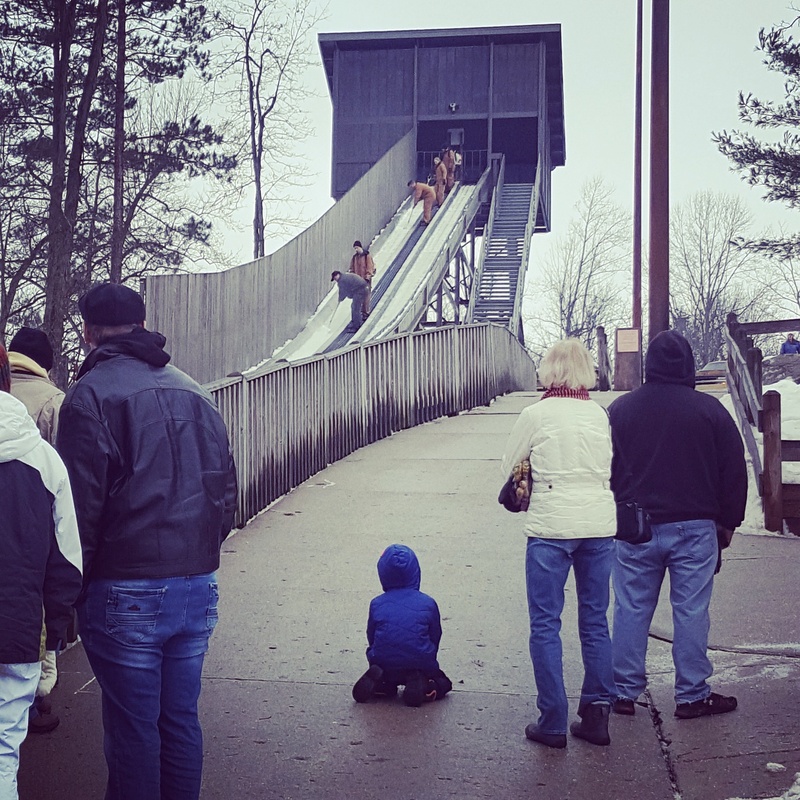 I’ve ridden that toboggan ride! What fun. Looks like a lot of fun! I quit going back to Iowa for Christmas, the last time we went, there was a foot of snow and cars and tractor trailers stranded all along I80. We do go every summer and that works out great. Looking at all those steps made all my joints ache! Haha, I held onto the railing with both hands and gingerly made my way down!